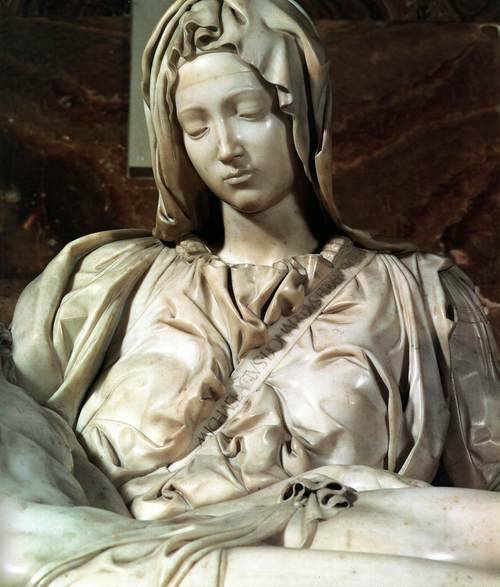 Michelangelo carved the Pieta at 24. Now, plenty of people have done VERY successful things in their mid-twenties, but let’s be real, Michelangelo blows the doors off all those featured in “30 under 30.” What the hell is Clinkle compared to significant religious iconography?! In fact, the piece was was so damn good, people didn’t even believe it was his. Michelangelo overheard visitors gawking and incredulous about the work—they thought it was made by another (more accomplished) sculptor, Solari. So, PISSED and rightfully so, Michelangelo carved his own name right on the sash in between Mary’s breasts. It was the only work he ever signed. People hated on the Pieta well after the Renaissance. Someone in the 70s climbed on her and screamed, “I am Jesus Christ!” while hacking away at her with a hammer. She suffered damage and a nose job. She’s now behind bulletproof glass in a totally different spot from her original location in St. Peter’s Basilica in Rome. Thanks for ruining the fun for all of us, Lazlo Toth. Pieta is Italian for “pity,” and now I know WHY. 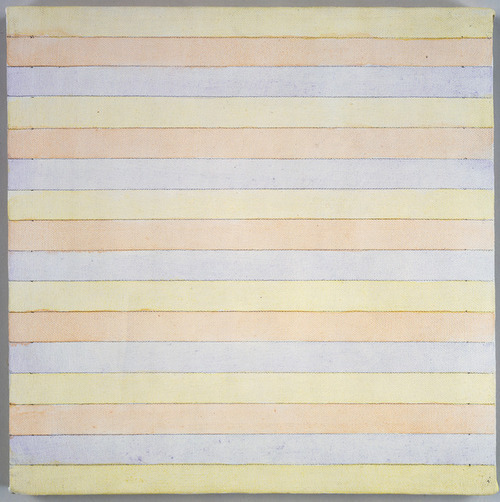 Last Friday, Google celebrated the birthday of Agnes Martin. Did you even notice? Unless you’re as obsessed with minimalist art as you are with this season’s push for pastels, you probably DIDN’T. Nevertheless, Martin’s work blends the grid’s mathematical accuracy with artistic wonder. She puts viewers on the same plane, makes two-dimensional works absolutely limitless, and yet, she stayed hella calm during her process. 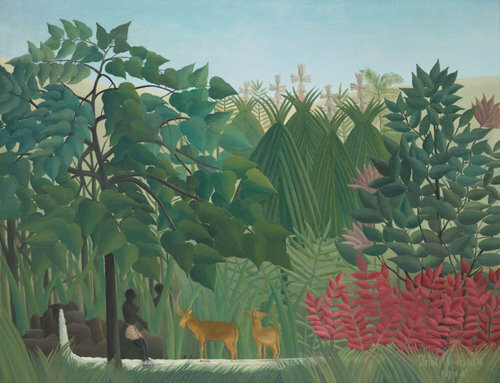 Henri Rousseau’s most famous for painting jungle scenes, and yet, the man never visited a jungle. Instead, he studied encyclopedias, botanical illustrations, and taxidermied animals. When all those Impressionists were outside being one with nature, Rousseau was chillin’ in the library. 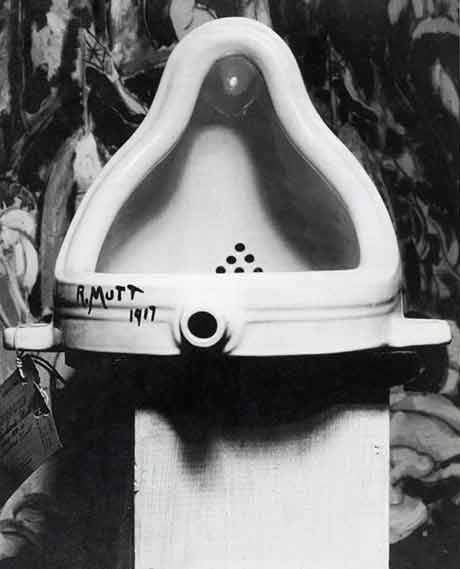 Et voila, Duchamp gives us the everyday urinal. The normal becomes the unnatural, the mundane into magical, the Kohler showroom looking like a “been there, done that” for every gallerina. Now go out there and make something that belongs to someone else your own. GO! PILLAGE! CLAIM! 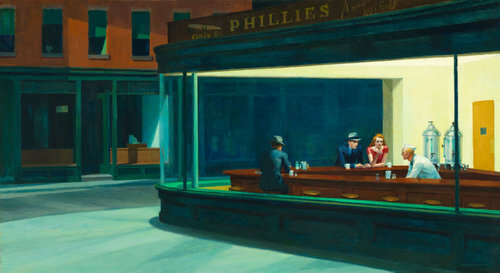 Edward Hopper painted this work in 1942 and within months, it was sold to the Art Institute for a cool $3,000. His wife Jo modeled as the redhead. It’s been parodied on the Simpsons for crying out loud, talk about influential. Vincent van Gogh’s “Self Portrait as a Japanese Bonze” was sent to Paul Gauguin as an old-school evite to to join him in south of France to create an artistic community. He had previously written to Emile Bernard that he was impressed with the tradition of Japanese artists exchanging artworks with each other and hoped the two chums would join him in Arles. I’m calling this the original bromance. It was later auctioned off in 1939 after being labeled “degenerate” by the Nazis and confiscated. 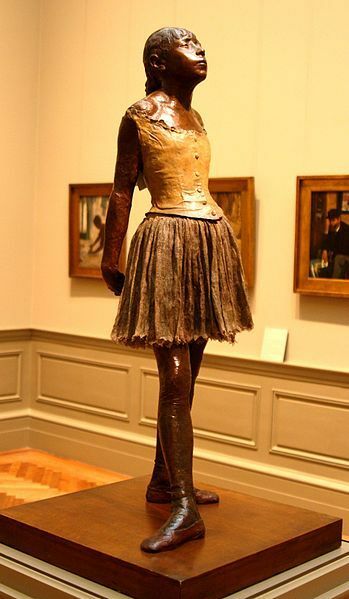 It now belongs to the Harvard Art Museum. Winged Nike of Samothrace is believed to have been part of an outdoor theater, coming down from the heavens with a full and successful fleet. She’s been standing in the Louvre’s main staircase since 1884, a year after she was discovered without her arms and her head (duly noted: she was removed during WWII for safekeeping with other armless sculptures, ahemmm, Venus de Milo). Perhaps more amazing than the fact she is made out of marble and she looks soaking wet is that there is an EXACT replica in the Idaho State Capitol. Idaho? Since when is Idaho celebrating naval victories from the 3rd century BCE?! Right, t-girl. Do your thing. Just so you know, that face speaks VOLUMES.